Formed in 1995 as a result of several successful design collaborations between longtime friends. Peter Jacobsen and Jim Hardy, along with design partner Rex VanHoose, remain committed to creating sustainable courses that combine beauty, challenge and fun for golfers of all skill levels. The combination of Peter's hands-on philosophy, and Jim's creative acumen has earned Jacobsen Hardy Golf Course Design a growing reputation as one of the finest design companies working today. Add Peter's dynamic personality and Jim's broad golf-development background, and it's no wonder Jacobsen Hardy Golf Course Design is creating such a stir in the golf world. 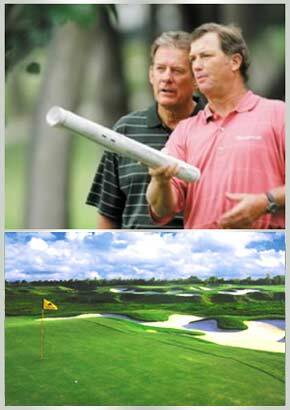 Peter's willingness to become involved in the physical development, marketing and overall success of a community - from making public appearances, to assisting in promotion of the property - takes the appeal capabilities of Jacobsen Hardy Golf Course Design to a level few architecture firms can match. As a former golf course developer, Jim has a unique understanding of the issues that Jacobsen Hardy Golf Course Design clients face every day. Accordingly, along with superior golf design, clients also receive concept analysis, project feasibility, leisure industry evaluation, financial planning, club operations and project construction management. Jacobsen Hardy Golf Course Design is one of the nation's highly respected course archticture firms, with projects completed on both coasts and several places in between. Jacobsen Hardy is currentley working toward the completion of a new 18-hole resort course, Rope Rider Golf Club, at Suncadia Resort in Roslyn, WA. Jacobsen Hardy anticipates Rope Rider will open next summer 2011. Additionally, Jacobsen Hardy has teamed up with American Golf to provide renovation services for Oregon Golf Club, a JHGCD original design located in West Linn, OR, and for Mountaingate Country Club in Los Angeles, CA.